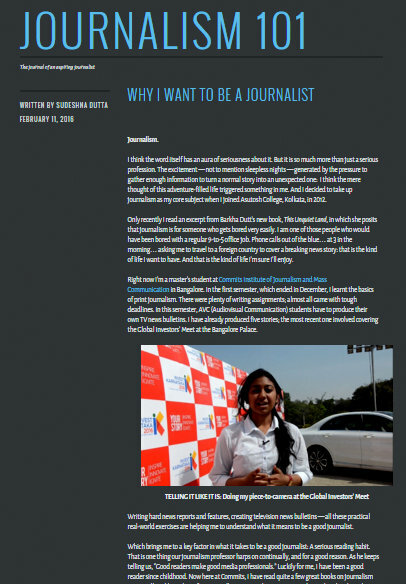 Earlier this month Commits student Sudeshna Dutta (Class of 2017) began publishing her blog, Journalism 101. Her first post is titled "Why I want to be a journalist". Welcome to the world of journalism. The thirst for news has never been greater, the news-gathering tougher, and the competition stiffer. So get ready for a rocky ride, but I promise you it will be one you will enjoy. And cherish. 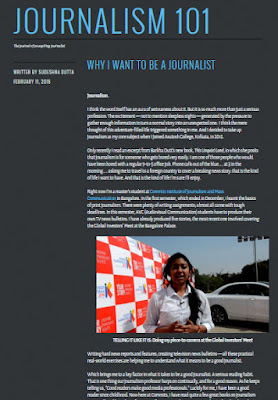 Sudeshna, you’ve learned the ropes and honed the basic skills of news-gathering and dissemination. It’s time now to put what you’ve been taught to practice and I’m quite sure you can do it. Don’t let anyone tell you otherwise. When I started out way back in the early seventies, it was said journalists were jacks of all trades, masters of none. Few had the privilege to specialise in a particular beat. Today, the approach to knowledge-based journalism (which is quite different from basic beat reporting) is more demanding. You need to specialise. At least that’s what I think. If it’s investigative reporting, then you need to be the best investigative reporter and work towards it. Be confident, work hard, and you will hit mother lode. A WORD OF ADVICE: Read, read, and then read some more. I cannot emphasise this enough. Look at issues with many eyes, always do your homework before you go out on those deadline-driven assignments, AND don’t ever be afraid to ask questions or question someone. I wish you the very best as you take the plunge. Feel the pain, bask in the glory. Enjoy the craft…. And the ride. Full disclosure: I love hearing about/from young people who want to become journalists, and so I am already sold on your dream. For I have always believed that journalism is a vocation, much like medicine. While anyone can get the marks (if they try hard enough) to make it to med school, a mere degree does not a doctor make. It takes passion and the drive to go above and beyond. The same qualities that distinguish a true journalist from a hack. Your passion has led you to the right place to learn the craft. Honing it is something only you can do. From the books on varied subjects that you have listed, I can see that you have followed the advice of your journalism professor. It is truly the best advice. Read everything you can lay your hands on. Even the bad ones teach you something – how not to write! I do have to add a cautionary note, though. Journalism is not all glamour and adventure. There’s a lot of grunt work involved, too. A lot of plodding through material to research the background, to get the details right, to uncover the unexpected angle. A lot of rewrites to finesse your work. Well before you get the 3 am call, you’ll be up nights, fighting to meet deadlines. That said, I can also assure you that you’ll have so much fun doing it, you’ll never “work” a day. You’ll meet the most amazing people from all walks of life and have the privilege of telling their stories. Every day will bring a new story idea, the opportunity to make a difference. I wish you all success. I am sure you will make your mark and your journalism professor proud. As a journalist who has never regretted becoming one and enjoyed every single moment of being one, I can assure you that you have made a remarkable career choice. My love affair with journalism started when I was in Standard VIII when we had to write an essay on our career choice. My mother advised me to consider journalism noting "you like to read, have a flair for writing and you are always curious about everything". That was an astute observation. Curiosity is what underpins great news stories, if you have that you will never be short of story ideas. Just writing well is not enough, you have to develop a "nose for news". Fact checking is also extremely important. Remember what you are told in journalism class – "When in doubt, leave it out" – I can’t emphasise this enough. Patrick and Shagorika have covered all other relevant points. I wish to repeat one of them: "Keep an open unbiased mind". It is harder than you think, we are all humans after all, but you have to try your best to do so. You are launching from a strong base – a reputed institution such as Commits and the best mentor a student can dream of in Ramesh. So belt up and enjoy the journey with all our best wishes.